Orange Creamsicle Cupcakes… reminds of me of the orange creamsicle ice cream treats I had as a kid. I remember as a kid we had an ice cream truck that came to our house about once a month. It wasn’t one like the ones you would see in the city. You have to know that I grew up on a farm in a very rural area. So this was an ice cream truck that sold all kinds of goodies from ice cream to assorted food items. If you live in the USA you may have had a visit from one of the Schwan Ice Cream trucks too. It was a real treat when the ice cream truck would come and my mom would purchase ice cream and ice cream treats. One of our favorites was a creamsicle ice cream bar. An orange sherbet wrapped around vanilla ice cream on a stick. 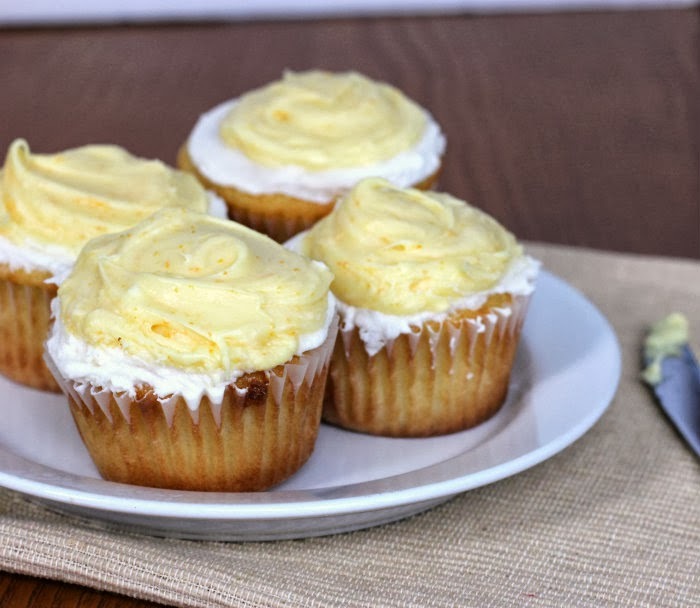 So when I saw a recipe for orange creamsicle cupcakes my memories of one of my favorite childhood treats came flooding back and I put the recipe on my to do bake list. 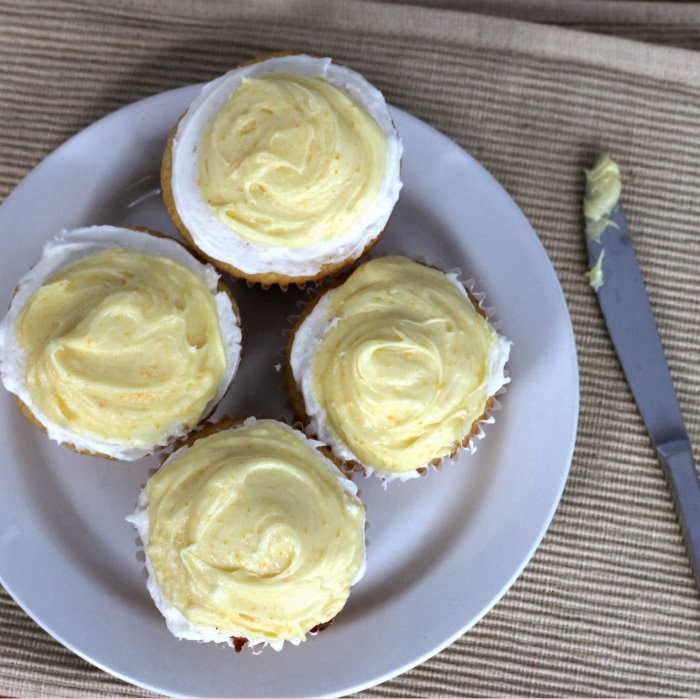 This recipe features a moist orange flavored cupcake topped with a vanilla frosting then topped with an orange frosting. 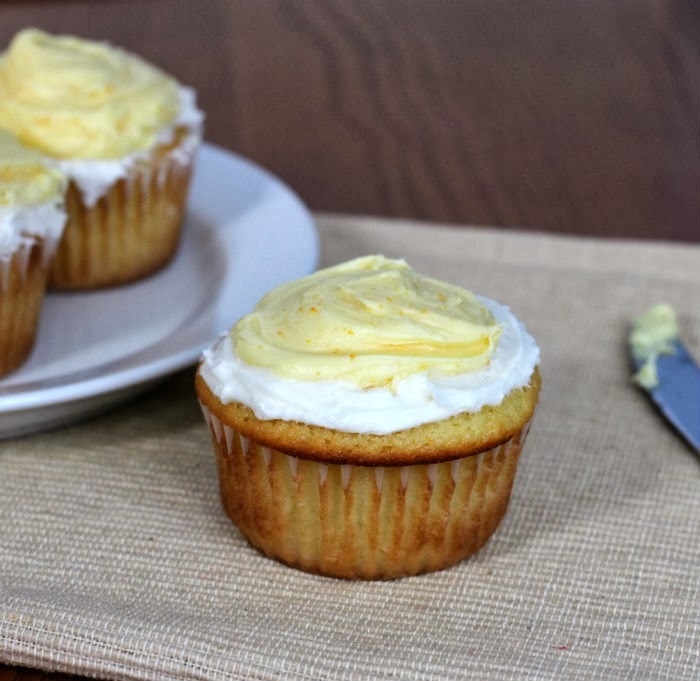 If you like orange creamsicles I am betting you will love these cupcakes. 1. Preheat oven to 350 degree F. Line muffins tins with paper liners. 2. For the cupcakes, in a medium bowl, combine flour, orange zest, baking powder, baking soda, and salt. Set aside. 3. Using an electric mixer, cream the butter and sugar on medium speed until light and fluffy. Add eggs one at a time, beating well after each addition. Mix in vanilla. On low speed, alternate adding flour mixture and buttermilk and orange juice, beginning and ending with flour, mixing just until the flour is incorporated. Do not over mix. Fill prepared muffin cups 2/3 full with the batter. Bake about 18 minutes, until golden. Cool completely before frosting. 4. For the orange frosting, in an medium mixing bowl, combine cream cheese and butter using medium speed on a electric mixer mix until well combined. On low speed, add orange juice, orange zest, vanilla, and powder sugar. Once incorporated, turn mixer to medium speed and blend until smooth. 5. For the vanilla frosting, using an electric mixer, cream vegetable shortening and butter until well combined. Reduce speed to low and add powder sugar, vanilla, and milk. Mix until combine increase speed to medium until smooth. 6. To assemble the cupcakes frost with the vanilla frosting over the entire top of the cupcake. For the orange frosting place a dollop of orange frosting and spread over top of the vanilla frosting leaving the edge of the vanilla frosting showing. I remember those creamsicle bars! They were so good. I bet I’d love them in cupcake form as well! I loved creamsicles growing up. Someone just told me today that there’s a creamsicle flavored yogurt, then I come here and find this recipe. We must all be craving spring. I love creamsicles! One of my favorites as a kid. So this recipe is right up my alley. Fun cupcakes — thanks.